Jack N’ Jill went up the hill to fetch a pail of water, but on the way, they was led astray and made their own platformer. Okay, so that is not quite how the original song went but we can make exceptions as we review Jack N’ Jill DX on Nintendo Switch. Created by Game developer Rohan Narang, Jack N’ Jill DX is a simple tale of navigating the little blob Jack to reach Jill. Jack must overcome many hazards like spikes, enemies and his own inability to stop near a ledge. It’s not all one-sided though. Jill is also a playable character and can be the heroine of her own story by trying to reach Jack. Jack N’ Jill DX originally released for mobile devices in 2013 under the name Jack N’ Jill (No DX). It is now available on Switch, PS Vita, PS4, Xbox One and Steam. The game is ported and published by our good friends over at Ratalaika games. Due to professional reasons, our editor Jack couldn’t review the game so he asked if I could do it instead. As a favour, I said I would and I am glad I did. Jack N’ Jill is a fun yet very addictive platformer with 7 worlds and 140 levels to play. There are also minigames that can net you tokens to unlock new hats or screen colour palettes. To unlock minigames, you do have to complete all 20 levels in each world. Upon completion of each world, you will unlock a minigame. To play the minigames however, you will need to collect coins from the main game. You will need around 100 coins to play each time so try to grab every coin you can. 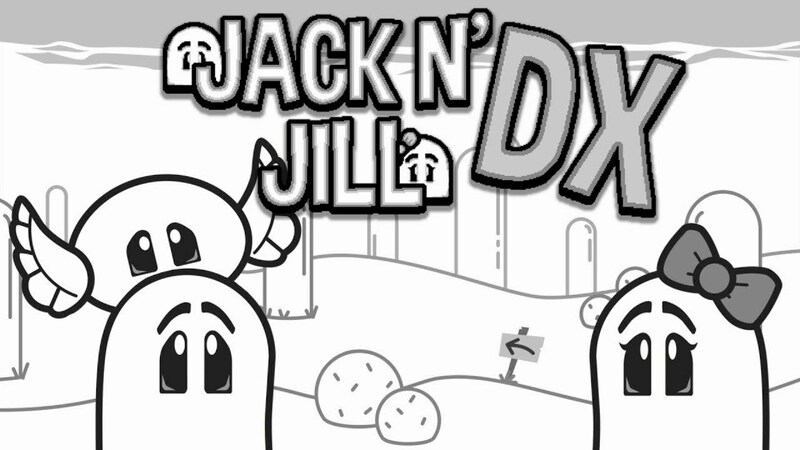 Jack N’ Jill DX is a monochromatic game that wouldn’t look out of place on the original Game Boy. It’s pixelated aesthetic is actually quite charming. At first, it might seem rather plain to look at but as you continue to play, you will realize that super 4K graphics are not important and that you can enjoy a game purely on its gameplay. The music is rather charming as well and just resonates retro goodness. It takes me back to the good ol’ days and reminds me a lot of a game I used to play with my brother, MC Kids on the NES. The general idea of each level is to get from point A to point B. You must leap over pits and avoid spikes and other hazards. There are a number of different power-ups and game mechanics that get introduced as you progress through the levels. You will learn to Wall jump, jump higher after bouncing on enemies, and that each power-up is necessary in order to complete each level. Power-ups are restricted to a time limit so once it is used up, it’s gone. The Boot allows you to run faster and Wings allow you to fly. The potion vial will allow you to kill enemies without having to jump on them. Knowing what does what will give you some idea of what obstacles you are about to face next. If you come across the boot, long jump sections are ahead. If you find the wings, then a ‘flappy bird’ type level segment is coming up. There are a number of different platforms and hazards like spikes, clouds, wall lifts, springs and baddies that you must use to your advantage in order to complete the level. Controls are so simple but the execution of them needs quick reflexes. The A button is the only button needed to play. Press A to make your character move and then again when you need to jump or flap your wings. Your character will automatically run in one direction until they hit a wall and then they will reverse course. If you jump on clouds however, you will stop running and will only jump when you hit A again. When on clouds, you will automatically face the direction you need to head next. Timing is indeed crucial as one miss-step can make you start from the beginning of the level again. Unless of course, you find a checkpoint on the level. Do not let yourself believe that this is a simple “Runner” game. Its graphics might look simple but the game has quite a lot of depth. I found myself making a lot of silly mistakes because I didn’t jump at the right time. Fortunately, I never found myself getting frustrated even after several failed attempts. Usually, I can get a little hot-headed but it was never the case with this game. It was more of “Oops! I did it again. Nevermind,” and I would just get right back on the horse and do it again. Most levels don’t take more than a minute to complete. The levels that do take longer usually have a checkpoint about halfway through so that if you mess up, you will start again from the checkpoint instead of from the beginning again. It is certainly a case of trial and error and once you master the split-second timing of pressing A at the right time, you’ll feel like a speed-running super ninja. If you like a little extra challenge, there are challenges to try and complete as well. Though most of them you can get on your initial playthrough, some require a little bit of baddie bashing or coin grabbing obsession. A couple of them also require you to complete certain levels without losing a life. You don’t really get anything in return but at least you can feel proud of your achievements after making it through level 7-20 without failing once. Easy to learn but it’s simple aesthetic hides a much more in-depth gameplay experience. You can pick up and play at any time as levels are relatively short and sweet. Jack N’ Jill DX would feel right at home on the Game Boy. However, with so many retro and retro-inspired titles on the Nintendo Switch, it doesn’t feel out of place on the console either. I enjoyed my time with Jack N’ Jill very much. The levels are varied and though some segments are similar at times. It never got stale or felt repetitive. It is one of the nicest and most decent titles I have played in a while.